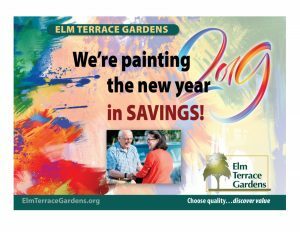 At Elm Terrace Gardens, we’re committed to providing our residents with choice in everyday life … and it starts with our flexible financial options. We have several financial plans to work within your personal economic circumstances. To discuss our financial options in more detail, schedule a personal visit by calling Erin at (215) 361-5656. You enter our independent living community by paying a lower entrance fee, with a set monthly service fee. Should you require healthcare in the future, you will receive the expert care you need with no increase in your monthly fee. Simply put, Lifecare provides assurance of future out-of-pocket costs that are predictable and affordable. As a Lifecare resident, you are able to deduct a certain percentage of your entrance fee and monthly fees from your federal income taxes. The reason for this is that the IRS recognizes a portion of the entrance fees and monthly fees as prepaid potential medical-related expenses. Be sure to talk with your financial advisor for details. With our Refundable Plan, you pay a higher entrance fee, but a lower than normal monthly service fee. Should you require care in the future, you will have priority access to healthcare services – available at the published per diem rates for each level. You pay only for the services that you use. The benefit of this plan is that you secure a refund of 50 percent of your entrance fee, which may be used toward future healthcare services if needed. This plan is ideal for those with long-term care insurance coverage or with robust financial sustainability. The benefit of our Fee-for-Service Plan is that you only pay for the services that you use. This plan has a small community fee that is 100% refundable and may be used for future health care services or returned to the resident/their estate. Unlike members of the outside community, you are given priority access to our healthcare facilities should you need them.